What is New Relic Reporting in Magento 2 admin panel? New Relic is a SaaS-based subscription service. This service provides detailed real-time visibility into business and performance metrics for data-driven decision making. There are four steps on using New Relic Reporting: Sign Up for a New Relic Account, Install the New Relic Agent on Your Server, Configure Your Store and Enable Cron for New Relic Reporting. Visit a New Relic website to sign up. Follow the instruction and choose the product that you want to install first. Application ID On the dashboard, click New Relic APM. In the menu, click Applications. Then, select your application. The number in the URL after /applications/ is the Application ID. 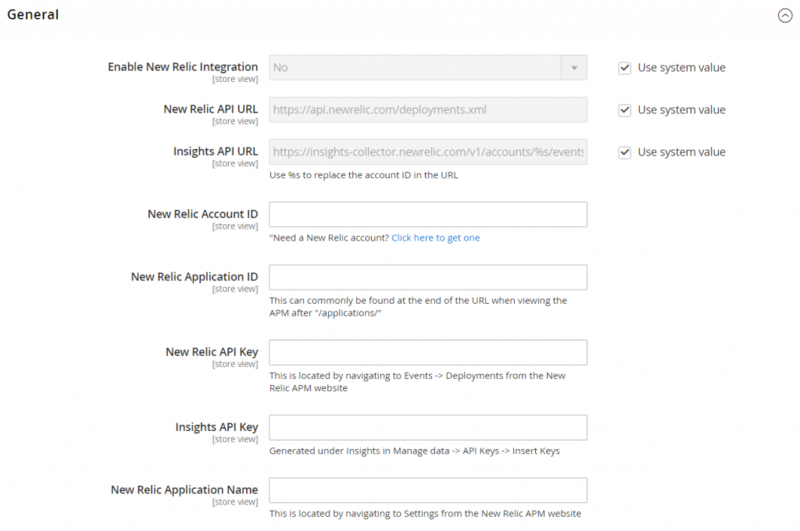 New Relic API Key On the dashboard, click Account Settings. In the menu on the left under Integrations, click Data Sharing. You can create, regenerate or delete API key from this page. Insights API Key On the dashboard, click Insights. In the menu on the left under Administration, click API Keys. Your Insights API Key(s) display on this page. To generate a key, click the plus sign (+) next to Insert Keys. To gather and transmit data using New Relic APM Pro, you have to install the PHP agent on your server. After selecting a web agent, click PHP. Make sure that cron is running on your server. Read Configure and run cron in Magento 2 if you need help. In the Insights API URL, replace the percent (% symbol with your New Relic Account ID) and input all required information and click Save Config. Set Enable Cron to”Yes and click Save Config. Above is a tutorial on using New Relic Reporting in Magento 2. Feel free to comment or contact us directly if you have any question. On the next article, we will describe New Relic Queries in Magento 2. Keep tracking Mageguides for more Magento 2 guideline articles.